For 45 minutes it was glorious. An easy-paced meander through an open valley. Ledgy limestone cliffs to our left, the clear rush of an untouched river to our right. Just us, the trout, and the Army helicopters occasionally thwacking overhead. My friends and I had planned a descent of Deep Creek, the 12-mile stretch of water that flows out of Deep Lake in the White River National Forest. It runs into the Colorado River right above Dotsero, where it turns and heads west through Glenwood Canyon. We’d heard that only a dozen or so people had walked down Deep Creek before, but that it was doable. We wanted an adventure and we wanted to get a look at Colorado’s next potential Wild and Scenic river. This isolated stream, which winds through limestone karst cliffs, is home to native trout and rare willows. It’s also a high-altitude training ground for the U.S. Army. Because of those competing interests, it’s become a surprising focal point for water conservation collaboration. Local water districts, government agencies, advocacy groups and ranchers with grazing rights are all in talks to try to find a way to compromise, to keep the stream pristine without cutting into anyone’s water rights or access. To address that, they’re hoping for federal Wild and Scenic Designation, but Deep Creek could get additional protection. There’s also a proposal to protect all the flows in the creek, which will come in front of the Colorado Water Conservation Board in early 2019. It’s a novel ruling that has only happened one other place in the state, Dominguez Creek. This protection has been a long time coming. Local citizens first proposed it 30 years ago, and Deep Creek was first deemed eligible for Wild and Scenic status in 1995. Last year, the Forest Service found it suitable for protection, which is the next step in the designation process. “Deep Creek is a rare example of an ecologically intact, lower-elevation watershed that is worthy of permanent protection,” the suitability findings declared. Colorado is home to the headwaters of much of the country, but only one other river in the state—a 76-mile section of the Cache le Poudre— is designated Wild and Scenic. It’s the most protective status a river can have. Wild and Scenic effectively means nothing can change on the waterway: no additional infrastructure, development or water It’s a federal designation, which carries precedent over state water law—tricky in Colorado where water rights are an individual’s landowner’s legal property—and in the past the designation has engendered fear about locking up water rights, which might otherwise render a river useable. Ever since the water in the state was first split up through prior appropriations, which designated use-it-or-lose-it legal obligations for water, setting aside any water for habitat management or instream flow has been contentious. But attitudes about conservation and collaboration have changed, especially in light of our decades-long drought. With them, .the conversation about protecting rivers and the values of free flowing untouched waterways have also shifted. Deep Creek has become thecontender for a range of reasons. 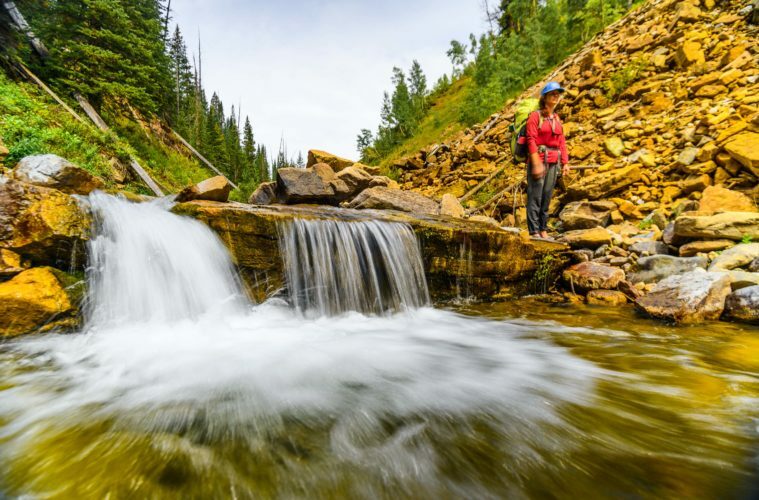 It’s still undammed (leaving it wild won’t endanger anyone’s current water rights) and its scenery, geology, fish and wildlife are considered “outstandingly remarkable values,” one of the major factors in determining Wild and Scenic designation. I wanted a glimpse of those values, and a chance to see what made this rarely-seen section special enough that ranchers were willing to sit at the table with environmentalists. So many places feel touched and used, even on public land, and it felt like a chance to see something truly wild. Deep Creek Canyon is an otherworldly landscape of shimmery sky high walls and glass clear pools, but my eyes glazed over with exhaustion. We had walked less than nine miles in nine hours, although the GPS would later tell us we made about four of downstream progress. I had sprained both my ankles, and there was nowhere that looked flat or dry enough to pitch a tent and sleep?. In the depths of the steep, rock-lined canyon I found a body-sized silty spot that kept me out of the water until it started pouring rain at 5 a.m. But isn’t this why we come to wildernss? Why we want to preserve it? Their way of going about it is by getting previously warring water users, like paddlers and ranchers, into the same room, and asking them to talk through what might work for all, and then using science and economic data to underline their plan. On Deep Creek, ranchers were initially wary about how their historic grazing rights might be impacted, and environmentalists were worried that designation would bring more traffic. But they’ve worked through traffic plans and included historic use. That seems to make most people happy. For the instream flow, the public has the ability to make flow recommendation for a new water right, but that recommendation has to be tied to a specific beneficial use—in this case environmental flows for indicator plant and native fish species. Engineers and fish biologists are currently researching the values of the stream for preseravtion. Rice says it takes about a year for the Water Board staff to do their diligence, but they’ll likely recommend the flows by early 2020. It might take years still for the Wild and Scenic designation to be approved, but it’s a major step toward collaborative, non-antagonistic water planning. Rice says that Deep Creek is proving to be a good example for how streams that aren’t particularly controversial, or don’t have contested water rights, can be a proving ground for future collaboration. Like politics, the walking was slow going. And in Deep Creek the second day was even more demoralizing than the first. The elk trail we’d been following ended in a sheer cliff band, forcing us to backtrack down the banks. Nettles and raspberry bushes sprung up and a choke of dogwood stems closed in. And then the gorge became cliffy and steep, with no bank to speak of. We traversed a imestone ledge, slick as ice. We carefully stepped over ankle-breaking juts of sharp edged granite, loose and slicked with moss. There was just enough current in the stream to keep you off your balance. Deep in the canyon, we stopped to chug trail mix, let our legs stop shaking and contemplate how much force it must have taken to propel a pile of massive logs on top of each other, to collapse them in like tinder, rotten and crunching. When we finally popped out on the road just upstream of where Deep Creek runs into the Colorado River, I hit the deck and vowed that I never wanted to see that stretch of river again, even though it was (excuse the pun) deeply beautiful. I would rather just know that it’s there, lightly traveled, as protected as possible. So much of what I consider wild or scenic, designated or not, is man-made or human touched these days. We have our hands in everything: noise pollution from overhead, ghosts of grazing animals, oil and gas drilling on empty lands. Faced with all of that inescapable development, it feels as if the only places left are the scrobbly weird ones, the scratchy, hard-to-cross creeks, the mountains that are a long walk from the trailhead. There’s a constant drive to claim and conquer everything big or rare or untamed. I admit that I have that desire in me, too. I’s a big part of why I’m here, but honestly I don’t think l like it. Fighting that drive is the big reason for of Wild and Scenic designation. It might protect us from ourselves and our most base instincts to conquer places, to take advantage of them, and use them until they’re gone, just because they’re there and because we can. It puts value on having beautiful, almost untouchable rivers. It leaves them how they are, remarkable values intact, no trails, no diversions, just free-flowing water. The 2018 Top Adventure Towns Numerology: State of Fun Going Big (Agnes) The November Issue is LIVE! The September Issue is LIVE!